Transfer to bus Station in Nazca. Trip on Bus Nazca- Lima (16:30 hrs - 00:00 hrs). Welcome and Transfer from the bus station in Lima. Welcome at the airport in Arequipa and transfer to the Hotel. City Tour in Arequipa 14:00 hrs to 18:00 hrs. Trip on bus to Puno. Welcome and transfer to the Hotel in Puno. Tour to Lake Titicaca, Uros Island, and Taquile. Transfer from the hotel to the bus station in Puno. Transfer from the bus station in Cusco to theHotel. Flight from Cusco to Puerto Maldonado 40 minutes. Travel by boat on the river Madre de Dios. Welcome lunch at Amazon Eco Lodge. Night in Eco Amazonia Lodge. Assessment of animals in the wild, otters, alligators, turtles, tapir, birds, etc..
Excursion by boat to the river Briol gamitana. Appreciation of turtles, alligators, birds and a variety of insects. Fishing and Swimming in the Rio Briol gamitana. Transfer from the Airport in Lima to the Hotel. Tour to the Sanctuary of Pachacamac. 1 Plane Trip from Lima-Arequipa. 1 airfare from Cusco to Puerto Maldonado. 1 airfare from Puerto Maldonado - Lima. Relocation of the Terminal 1 bus to Cusco hotel. After having our breakfast, we will transfer you to the bus terminal, depart for Paracas, upon arrival we will transfer you to the port of Paracas, where we will begin the tour to the Ballestas Islands passing through "El Candelabro" a giant image on the slope of a Hill. Upon arriving at the Ballestas Islands, you will visit the different islands for two hours, observing sea lions, seals, penguins and guano birds. After arriving at the port we will make the tour to the Paracas reserve. In the afternoon we will go to the bus terminal of the city of "Paracas" to take their bus to the city of Nazca, upon arrival our staff will be waiting for you to transfer it to your hotel in the city of "Nazca" the hard trip generally 3 hours. (Photo: Ballestas Islands in Paracas). In the morning, having breakfast, we will transfer you to the Nazca airfield to start the adventure of flying over these fascinating figures, for 45 minutes you will enjoy this experience, from where you can see the giant figures of animals and plants, drawn by the pre-Inca cultures with an end not yet discovered, many believe that these figures were made by extraterrestrials, among which are the monkey, the spider, the hummingbird, etc. Then there will be a visit to the "Cementerio de Chauchillas". Then at 2.30 p.m. they will be transferred to the Nazca bus terminal to make their return trip to the City of Lima, where our staff will be waiting for them to take them to their hotel. (Photo: Spider of the Nazca Lines). Flight Lima To Arequipa / City Tour in Arequipa Early in the Morning after having breakfast we will take to the Aiport in Lima to catch the flight to Arequipa.We'll be waiting for you at the Airport in Arequipa on your Arrival Date with an add with your name , we will take you to your Hotel where you can rest in the morning untill our visits start, around 13:30hrs We will pick you up from your Hotel starting the City tour in "La Ciudad Blanca" including the Convent of Santa Catalina:A cloistered convent built in 1580 and was enlarged in the 17th century. The over 20,000-square-meter monastery is predominantly of the Mudejar style, and is characterised by the vividly painted walls. There are approximately 20 nuns currently living in the northern corner of the complex; the rest of the monastery is open to the public. We will also visit Main Square , Compania of Jesus, Cayma and Yanahuara, with a magnificent view of Volcano'' El Misti''. (Foto: Plaza de Armas de la ciudad de Arequipa.). Arequipa-Colca Valley Early departure towards the highlands passing through Yura-Pampa Catahuas and La Pulpera with good possibility of observing groups of wild vicuñas and fighting cattle. Stop en route to see petrogliphs in the Caves of Mollepunco and in the town of Callali to see natural hill formations with the appearance of enchanted castles. Drive to La Calera to enjoy the thermal baths under the stars. Return to Chivay for overnight. (Foto: Vicuñas in Arequipa). Bus from Arequipa To Puno We will have almost all the morning wheter to rest or have little visits around,in the afternoon We'lll go to the Bus Station to travel to Puno, in Puno our staff will be waiting for you and will transfer to the Hotel in Puno, where you'll spend the night to start with our visits early next morning. Tour to Lake Titicaca Early in the morning you will be picked up from your hotel by our local guide and then transferred to the harbor. We start off our boat excursion of Lake Titicaca by visiting The Uros Floating Islands, a small community that has lived on these reed Islands for decades. Centuries ago the small indigenous Uros tribe conceived of the islands as a way to isolate and protect themselves from rival tribes, the Collas and the Incas. The Uros people harvested the reeds in the shallows of the lake, bundled them together tightly and built floating island platforms complete with reed houses and canoes, creating in this way their own little world. After strolling around the floating Islands, we continue our journey towards Taquile Islands (2 hour aprox. ), a traditional Quechua speaking community, full of ancient agricultural terraces and some ruins dating back to the pre-Inca times. The Taquile population was relatively isolated from the mainland until 1950s, and the notion of the community and family is still very strong among them. At the top of the Island, you will have free time to explore this place on your own and afterwards you will meet the group for lunch at one local restaurant. After lunch, we will descent to the harbor to take our boat back to Puno. We will be back in Puno by 17:00 h. approximately. After breakfast, we will take you to the bus station to start with our trip to Cusco this tour lasts around 8 hours you will have 4 guided visits, Andahuaylillas's temple or South American Sixtine Chapel , the Inka temple of Raqchi, Buffet lunch in Sicuani,La Raya at 4335 m.a.s.l and the Inka Aymara museum of Pukara. Every visit has a duration of 20 or 40 minutes, where the passenger will be able to make questions, take photos and walk a for a while, doing our trip very pleasant .Then we will arrive in Cusco, and our staff will take you to the Hotel. (Photo: Raqchi). Qenqo: Ceremonial and ritual center, amphitheatre where sacrifices were made.Puca-Pucara:An old tambo (resting place), monitoring place throughout the Inka Empire Routes. This tour starts around 9:00hrs., we pick you up from your Hotel, we have a guided tour to the Sacred Valley of the Incas, over the Vilcanota river, with a panoramic view of Pisac an old Inca City and a visit to the Inka market in this village, where we will have the chance to know in a closer way its people customs and get good bargains with the handycrafts and souvenirs sellers, afterwards we'll head for Urubamba, traveling on the borders of the river Vilcanota. 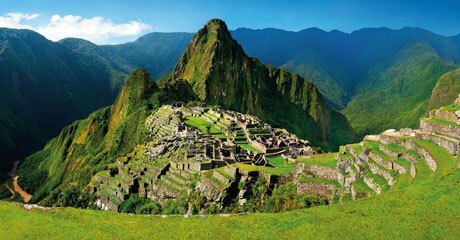 Twelfth Day: Free day in Machu Picchu "The Lost City of the Incas"
Free day in Cusco You'll have a free full day in Cusco, so you can go and visits different interesting places on your own. Flight Cusco - Puerto Maldonado / Eco Amazonia Lodge After having breakfast we will drive you to the Airport in Cusco for your flight to Puerto Maldonado Peru's capital of biodiversity. Following pickup at the airport, our trip begins with a tour of the city by private bus. We'll continue to Capitanía, a small river port, where we'll board a motorized boat to cross the Madre de Dios River. As the trip progresses, we'll become immersed in the natural surroundings of the jungle while observing the ronsoco, caimans, turtles, herons, cormorants and other animal species: We'll arrive at the Ecoamazonia Lodge and enjoy an exquisite welcome drink. Then, we'll settle into our bungalows and have lunch. In the afternoon, accompanied by our specialized guide, we'll visit MONKEY ISLAND, a unique place at the heart of the Madre de Dios River just 5 minutes from the lodge. Along the way, we'll take in the extraordinary landscapes and exuberant flora that are home to a variety of monkey species. These monkey species include maquisapas, capuchins, lion monkeys, puffins and cotos, along with other animal species like the coati, sloth, and a great diversity of birds. We'll complete our visit of the island while enjoying the sunset the most impressive moment of any day in the jungle. We'll end the day with a pleasant dinner. Lost Cocha After breakfast, we'll begin an adventure through the virgin forest, accompanied by our local guide as we explore deep into the jungle and reach the LOST COCHA (COCHA PERDIDA). The Lost Cocha is a refuge and feeding ecosystem for a tremendous diversity of animals. There, we'll have the opportunity to observe otters, caimans, turtles, sachavacas, birds of every color, the majestic jaguar and a variety of fish. This unique area, as it belongs to the Ecoamazonia Reserve, remains utterly intact, with large marshes and natural springs. We'll ascend to and extraordinary vantage point, from which we'll have a chance to observe the magical jungle, followed by a pleasant canoe ride around the lake. We'll return to the lodge for lunch and in the afternoon, we offer an optional visit to the botanical gardens. If you'd rather relax, you can enjoy the Amazonian Pool and dinner. Briolo and Gamitama Rivers Breakfast, at the indicated time we will start another excursion across the magic jungle where we will sail though the Madre de Díos River, till to get to the beginning to a hiking trek to the rivers GAMITNA / BRIOLO; born in the heart of the virgin jungle, these two rivers with their winding ways, they form huge sailing channels then we will return by canoe, observing closely animals like, turtles, caimans, butterflies and a great variety of insects. Then we will arrive to the lodge, dinner and overnight. Flight from Puerto Maldonado to Lima / City Tour in Lima Early we will take you to the Airport in Puerto Maldonado in order to take the flight to Lima, you will be welcome back at the airport in Lima and transfer you to the hotel. We will begin our tour through the modern residential districts of Miraflores and San Isidro. We will visit the financial center, the Golf, El Olivar, the Huaca Pucllana (the pre-Inca ceremonial temple in the shape of a pyramid) and the Love Park on the Malecón de Miraflores. Continuing with our tour, we will go to the Historical Center of Lima, we will know the Plaza San Martin, its balconies and old houses, the Plaza Mayor with its most important buildings and finally we will enter one of the most important convents of the seventeenth century. A complete tour with the comfort and attention of a modern tourist service. Located only a few kilometers south of Lima, it was one of the most important religious centers at the time of Spanish arrival. The passing of the centuries and the ruthlessness of enculturation have not been able to erase the deeply embedded religious meaning that this citadel had for our ancient cultures. People came from all over to pay homage to Pachacamac. We will visit the Site Museum, Conjunto Adobitos (Adobitos Complex), Templo de Mamaconas (Mamaconas Temple), Templo de Pachacamac (Temple of Pachacamac), and the Templo del Sol (Sun Temple). We will drive you to the Airport in Lima for the farewell.